Fantasy Hockey Chutes And Ladders: No April Showers Needed! We have survived much this fantasy hockey season but now comes the last regular season edition of “Chutes And Ladders”. Riding the fortunes of a fantasy hockey team can be a lot like the original Milton Bradley game. There are enough twists and turns to drive any normal person crazy. So imagine what it is like for the average hockey fan who takes on a fantasy hockey league. Week 25 (26 for some of us). Last week was the end for some and for others this is a continuation of the Finals or is actually the finale. Whether it is a dynasty or single season league, it all comes down to these crucial games. If you made it this far, congratulations. Also if you are in rotisserie or points leagues and can sniff the title, we will try our best to steer you in the right direction. Essentially, who is in or out of lineups is pertinent and crucial to success at this level of fantasy hockey. This is it ladies and gentlemen. The margin for error is gone. Reality dictates this fact like a Scott Stevens check. Injuries do really play a big part in fantasy hockey now but hey there were some awfully good fantasy performances last week. The fantasy playoffs are almost over and it is time to first reveal our Fantasy Player Of The Week. By the way, it is rare to have a repeat winner but I believe we may have one again. Congratulations to Evgeni Malkin of the Pittsburgh Penguins on winning this week’s Fantasy POTW. The Pittsburgh forward terrorized opposing goalies to the tune of nine points in the last seven days despite his ice time laying right around 21:30 a night. Little of that mattered as Malkin was simply just too good once again. This is his sixth appearance on here this season which leads all players and the only repeat winner to do it twice. Malkin is now over 100 points with a very outside chance of a 110 point season. His six goals this week were otherworldly. Sometimes fantasy does not always mesh with reality. It actually looked like a video game at times out there for the Penguin. Also, the last players to have a 50-50 season were Sidney Crosby and Alex Ovechkin. Malkin is just two goals away from accomplishing this rare achievement. Either way, think of how much Evgeni Malkin has saved your bacon if you owned him on your fantasy team. Between Malkin and running mate James Neal, if you did have both, think of how lucky you truly are as a fantasy general manager. 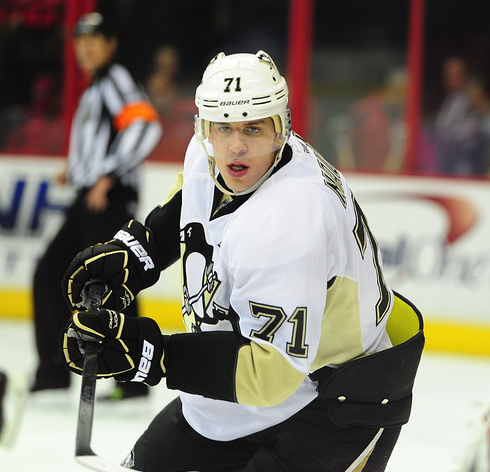 Congratulations again to the player who wears #71 for the Pittsburgh Penguins. Now it is time to take a look at a few new injuries that seem to be popping up in fantasy circles as well as some older ones too. The injuries are now at critical mass for the final week. Please watch for teams shutting down players as seeds are settled or teams are just out of contention. It is going to be one of those weeks. Chances are your team has been impacted in some way or another. At any rate, here are quite a few key injuries for this week with updates. Simon Gagne (Los Angeles Kings) — Gagne is currently on the IR with concussion like symptoms and with his previous concussion history, Gagne will not be back for the regular season plus the playoffs it seems. The problem lies in the fact that Gagne has not really progressed but as Darryl Sutter proclaimed Gagne is “Further than closer!”. Simply it would be prudent to just flat out drop Gagne at this point. He is not going to do anything more than hold up an IR slot. Nathan Horton (Boston Bruins) — This is just another sad story in what has become unfairly in some ways “the year of the concussion”. Horton has had another fairly substantial setback which means honestly you may not see the power forward until sometime in May at the very earliest. Horton will not be back this month at all which proves the adage that there is no such thing as a mild concussion. The move for Brian Rolston turned out to pay off as he is on a six game point scoring streak including eight points in his last four contests. The IR is where Horton will roam. Jimmy Howard (Detroit Red Wings) — The appearance of Howard and no setbacks were two things that were music to every fantasy general manager’s ears. Performance was not even an issue and Howard will see extensive time this week. This is going to be a key week for him and for many. Let’s see how he does in this crunch time which may be a preview of what he does in the NHL Playoffs. Tuukka Rask (Boston Bruins) — Here are a few from the how the injuries can change hours after press time argument. Sometimes there is no way of knowing but Rask is still out due to that groin strain. Fantasy owners may consider another option because Rask may only get a start or two tops. We are just being realistic at this juncture. Keep up on the daily Boston beat writers because Rask could return this or next week. Niklas Backstrom (Minnesota Wild) — The leg/groin injury has healed enough and Backstrom is now back in the lineup. However given how fragile Minnesota has been in the goaltending department, and in general, it may be a pretty good idea to pass on Backstrom for the rest of the regular season. Columbus Blue Jackets — They have at least a half dozen players out for the season and really have mailed it in. Honestly if you have any options from their team, it may be almost prudent to bench them aside from Rick Nash. Yes ths is how dire it has become in Columbus. Other than maybe Allen York, staying away from this team may be prudent. Nicklas Backstrom (Washington Capitals) — He is back as Backstrom returned on Saturday but the most important thing is that the Center has a chance to take a few games in order to get the engine running in the right direction. The ice time will rise as the week goes on so that he is truly “playoff shape” so fantasy wise he is a pretty good bet. Christian Ehrhoff and Tyler Myers (Buffalo Sabres) — When one defenseman goes down, there is a problem. When two are injured almost at the same time, that is a major problem. Ehrhoff is the more serious of the two and will definitely miss the rest of the regular season. Myers is out at least Tuesday with just a bruised foot and maybe longer depending on treatment. It has to be extremely frustrating for the Sabres to come this close and then have it come crashing down. Fantasy owners are really feeling the pinch here. Jeff Carter (Los Angeles Kings) — I hear the words “bone bruise” and cringe because Nicklas Lidstrom missed ten games with one around the ankle area a lot like Carter. It seems that the injury is not as bad but with a week left in your season, can you take the risk on a hobbled offensive threat? Our answer is no but some are going to anyway. The best bet is to see how he is later in the week and make the conscious, best decision you can. In other notes, keep an eye on Matt Duchene, who seems to have a magnet sadly with that foot and ankle area. Also, with less than one week to go, start expecting some injuries to not necessarily be named. After all, teams tend to play it more close to the vest this time of year. Players getting “rest” will also be an issue. This is essential and can often change with very little notice. Backups and players that normally would not see top ice time might. Be aware of this when making those roster decisions. No one ever wants to lose a title because of a “coaches decision”. Fourteen NHL teams have five or more injuries at the current moment. Players are coming and going so it is important to check out Twitter for the absolute latest. Here are the ladders…….that torch the Spring…. These are for the players who have seen their values shoot up for Week 25. Some are waiver wire pickups but most are not. March is when the intensity ratchets up and the fantasy cream is separated from the muck. Let’s get down to business. Josh Bailey (New York Islanders) — Yes his name is being used here so hopefully hockey people do not go into a mass panic. Bailey had a stellar nine point week on a line with Kyle Okposo and Frans Nielsen. Bailey had seven assists while Okposo had a whopping six goals. It often seems like the Isles top two lines never quite click at the same time. This week was about the closest they were ever in sync. Bailey had a very good March averaging around a point a game. This week, you have to play him at the very least. Sidney Crosby and James Neal (Pittsburgh Penguins) — Crosby and Neal had eight points each in the last seven days. Neal had four goals and Crosby looked very good once again. When Pittsburgh goes four forwards and Kris Letang on the power play, it is almost criminal. The Penguins may not have seen much in the way of W’s this week but they are still scoring anyway. So the goaltending was not so hot. Hey, it happens. Pittsburgh still has unfinished business with the four seed in the East so expect the points to rain down. Zdeno Chara (Boston Bruins) — Sometimes we forget to praise the defenseman but once again the tall man from Boston reminds us of our fantasy transgressions. Chara had eight assists and a +6 last week on 11 shots. Granted, he did not score but his six hits, six blocks, and that ATOI was a boon for fantasy owners needing a little help. We will say this watch Chara’s ice time this week as Boston has clinched the two seed. This is as if one had enough to worry about with fantasy hockey. Marc-Andre Fleury (Pittsburgh Penguins) — It hurt a bit to watch Fleury look like a sieve this week twice against the Islanders and then against the Flyers to add fantasy insult to injury. Imagine being a Fleury owner last week and what it must have felt like. Yes that toilet sound you may have just heard is an indication. When a goalie gives up four and five goals like that, there is little one can do. Hopefully Fleury turns it around this week because as Fleury goes, so go the Penguins. The Resting Bug? — Yes this sounds odd but hear us out. Jason Spezza and Daniel Alfredsson were more or less rested on Sunday against the Islanders. For those who could not adjust their rosters, it was the worst of nightmares. Yes this “rest” gives players a chance to shine that normally would not but it just wreaks havoc on a fantasy owner in ways that will make a person pull their hair out. Please expect much more of this to happen this week. It never fails and honestly to the coaches that do this, you are killing us. If they are going to get injured, they are just going to. Ryan Getzlaf (Anaheim Ducks) — Getzlaf has one goal in his last 32 games. That is not a misprint. Anaheim’s whole first line has resembled a vacuum going in the wrong direction for too many stretches this year. If you are looking for goals and even for assists, Getzlaf may be the wrong option this week and he is plummeting down early draft boards for next season. Wouldn’t you like to own a nice consistent player like Teemu Selanne? It is something I never would have thought. Do not start Getzlaf this week either. Well that wraps it up for this week. Good luck and hopefully it is a solid Week 25 for everyone out there. There is always the unexpected in fantasy hockey and we hope to always spotlight the expected also. Next week we unveil the next chapter. Do not forget to follow us @TheProgramBTR for all your fantasy hockey questions and more. Thanks again for reading.